This fashionable heavy duty two tone tan and brown fade proof design is the most favorite collection for all outdoor covering needs. This cover is made of woven polyester fabric and special water-repellent and resistant undercoating. Not only will your grill, fire pit, firewood, tote and patio furniture be protected from mother natures weathering elements, but you'll be protected with the easiest warranty in the industry. If your product fails within the 3 year warranty period, no worries and take advantage of our Hassle-Free warranty program supported by our US-based customer service team. 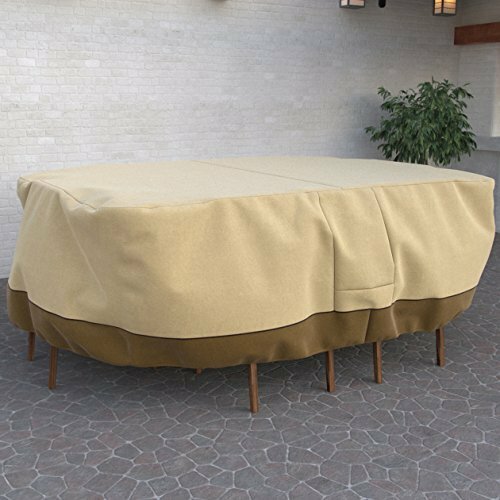 HEAVY DUTY PATIO FURNITURE COVER: Fits oval patio tables and 6 standard chairs up to 108" long x 82" wide or rectangular patio tables and 6 standard chairs up to 102" long x 76" wide. If you have any questions about this product by Dura Covers, contact us by completing and submitting the form below. If you are looking for a specif part number, please include it with your message.